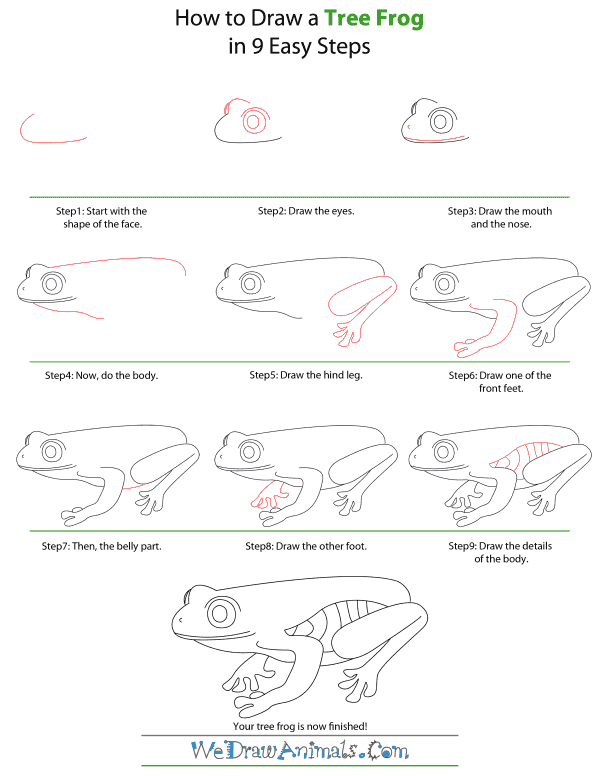 In this quick tutorial you'll learn how to draw a Tree Frog in 9 easy steps - great for kids and novice artists. 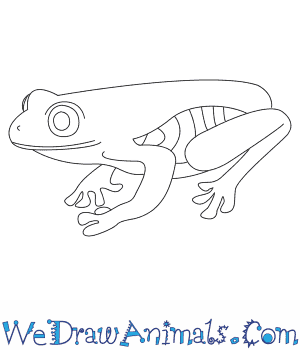 At the bottom you can read some interesting facts about the Tree Frog. 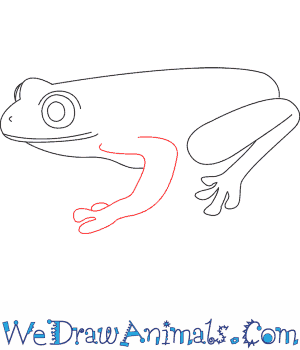 Step 1: To begin drawing your tree frog, start with the shape of the face. 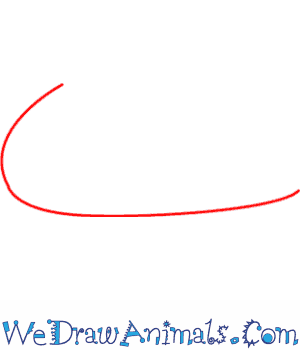 Draw a line that is curved on the left side and flat on the bottom. 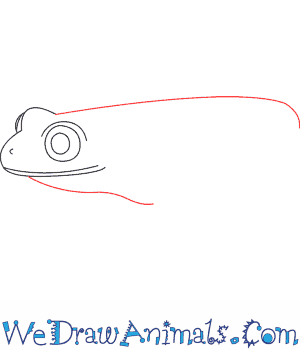 Step 2: Now draw the eyes. The eye looks like a large circle with a smaller circle inside of it. On top of the eye, draw a curved line. Step 4: Next, do the body. Draw a long straight line at the top and a shorter curved line at the bottom. 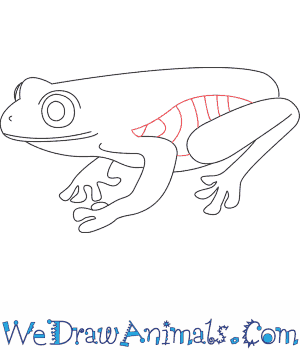 Step 5: Draw the frog's hind leg. Frog legs bend backwards, unlike your legs, which bend forward. 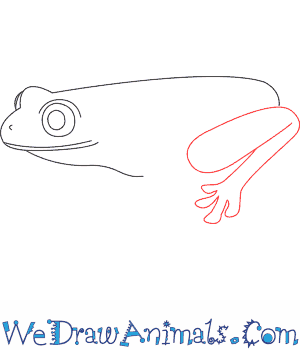 Step 6: Next, draw one of the front feet. Frogs have four rounded toes on each foot. Step 7: Then draw the belly. This is just a short line connecting the back leg to the front leg. Step 8: Finish the details of the legs by drawing the last foot. Step 9: Your last step is to draw the details on the frog's body. Draw a long horizontal line with smaller lines going up and down the body. Tree frogs are a species of frogs that are small compared to other species. They live in warm regions around the world, in trees of jungles and forests. There are hundreds of tree frog species. When tree frogs are born, they are tadpoles. It can take weeks to months for a tadpole to become a frog. The size of a tree frog depends on its species. In general, tree frogs are about 1 to 5 inches and weigh less than an ounce. The average lifespan of a tree frog is between 2 and 4 years. Tree frogs usually eat small frogs, insects, or worms. 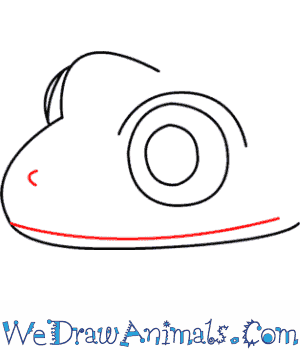 Each toe of a tree frog is shaped like a disc. They use their toes as suctions so that they can stick to trees without falling. Most species of tree frogs can change their colors to camouflage into their surroundings. The Cuban tree frog is one of the largest species. It can grow to about 5.5 inches. The red-eyed tree frog is one of the most easily recognizable species because of its red eyes, which scare away predators. The blue-sided tree frog is an endangered species that is native to Costa Rica.